Can I Paint an Outdoor Electrical Box? Part of turning your outdoor space into a relaxing natural oasis is making obtrusive necessities fade into the background. Once the trash cans are screened and yard tools are safely housed, it is tempting to give everything within view a coat of paint to match the house or its trim. There are, however, a few cautions you should observe before painting your outdoor electrical box. Paint an outdoor electrical box with care. Before painting the box, check with your local building department. Building codes may prohibit doing anything to the box, permit painting or regulate the kind of screening you can put around it. If you live in multifamily housing, check with your condo or coop board before painting the electrical box. Enclosing your electrical box may actually help put the electrical box in the background. Again, check the codes and local rules about enclosing the electrical box. Building codes are usually very specific about the materials you may or may not use and the distances an enclosure must be from the electrical box. 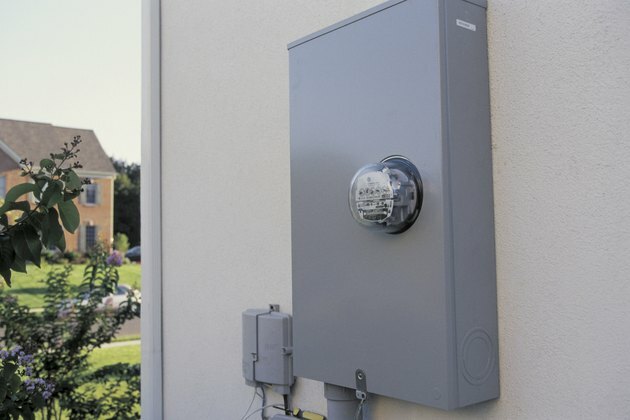 Any enclosure must provide easy access to the electrical box for meter readers and public utility workers, as well as the homeowner. This means no locks or tricky latches. In some areas, poor access to the electric box can result in an estimated utility billing, which is generally higher than the actual charges. Before painting, mask any meters or electrical connections with tape and plastic. Any paint can be increase the flammability of the box surface in case of an electrical short or malfunction. Wipe the surface clean, but avoid using flammable cleaners such as alcohol or mineral spirits. If painting is your best alternative, choose paint that will weather outdoor conditions. Clean the box cover lightly, and apply a coat of rust-preventing primer before putting on a topcoat. Continue with the primer as a second coat, or use an exterior-grade latex or oil paint that matches your house or trim paint. If you're using an oil paint, keep mineral spirits or other paint solvents away from the box. You can paint the inner side of the box door, but do not paint anything else inside the box. Getting paint on fuses, housings or circuit breaker switches can be dangerous.